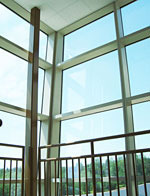 For nearly 60 years, Wausau Window and Wall Systems has engineered window and wall systems for a variety of buildings, including schools, hospitals, offices and condominiums. Wausau works closely with architects, building owners and contractors to realize their vision for aesthetic beauty, sustainability and lasting value. The addition of Custom Window™ by Wausau expands our product offering to better serve customers and the historical renovation market throughout the country. New from Wausau: The 5250i-XLT CrossTrak™ Sliding Door offers high-rise AW performance and easy installation, and can be selected with conventional or lift-and-slide hardware.